Downloaded Plaisir. Hers is the definitive Mimi. Thanks, Taminophile. 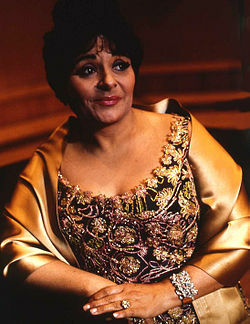 Victoria de los Angeles was my first connection to opera when my Dad gave me the Highlights from Carmen when I was 12. She remains my measure of strength, grace and beauty of voice (and person). Fabulous to hear and see how she maintained all that until late in life. Just wish I had seen her on stage. Victoria de los Angeles is the only Manon in my mind's ear. We are so fortunate that the height of her career was contemporaneous with the LP era and the recording of so many complete operas, as well as recitals. Her EMI Mimi and Butterfly (both recordings, although the earlier with Di Stefano is preferable overall) are treaures. Her Carmen, with Beecham at the helm, is marvelous, a very different, more feminine (and therefore more dangerous) interpretation of the role than the usual smoke and dusk. Her Marguerite in both the mono and the stereo Faust (with Gedda and Christoff, led by Cluytens) is a treasure, another role engraved on the mind's ear. Among the many wonderful song recitals, her EMI recording with Georges Prêtre of Ravel's Shéhérazade is an abcolute must-hear. The original album also contained Ravel's Cing mélodies populaires grecques and Deux mélodies hébraiques, Debussy's Air de Lia from L'enfant prodigue, and two mélodies of Duparc: "Phydilé" and "L'invitation au voyage". The album was re-released in a recent EMI compilation "The Fabulous Victoria de los Angeles" and she is indeed. The refrain from "L'invitation" well describes her voice in the recording: "...luxe, calme, et volupté..."
I had the great privilege of hearing her live in recital in Baltimore in the early 1960's. Debussy, Fauré, Schubert, Brahms, and Falla - a memorable evening. We are so fortunate she made so many wonderful recordings, even though she always preferred the intimacy of the recital stage.